We would like to share with you our Hearling Loss journey and what we are doing to allow our children to be ALL THAT THEY CAN BE!! God has blessed our family with special ears for our children. But He did not mean for this to be a set back but only a gift to receive more. We had our first visit with Price to see Dr. Molony last Friday. Dr. Molony agreed that it is time for Price to begin his journey for his first CI. 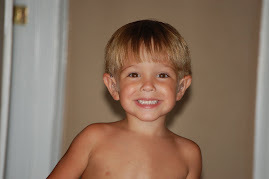 We found out about Price's hearing loss in May 2008, two months after he turned 3. He was diagnosed with a mild sloping to moderate loss in both ears. Since then his loss has progressed and now it is moderate-severe sloping to profound bilateraly. 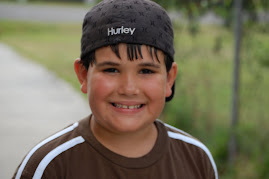 He has worn Siemen hearing aids since June 2008. He was placed in a reversed mainstream Pre-K class and has done GREAT. He has had speech therapy twice a week for the past year and a half. But with his progressive loss he is still missing those hard to hear sounds, s, th, f, and p. I am a little nervous because he is older than Sophie was when she was implanted. I feel that since he is older it will be more tramatic for him. I am also nervous how he will accept the CI. Being he has had the capability of hearing thru his hearing aids for the past 17 months. This will not change my mind in getting the CI, but my concerns are different than they were when I decided to get both of Sophie's ears implanted. I am very excited for Price. This will only boost his life in so many ways! I am eager to see the Nucleus 5 up close! I want to apologize for the laps in time from the last time I posted. I have had computer problems for the last 4 months and have just been able to get all of that fixed. The kids are doing wonderful. Andrew made honor roll this last nine weeks :) So that was a great accomplishment for him. We had a great Thanksgiving and Christmas. Oh and the Snow Day was great too. Lots of new words for Price and Sophie on the Snow Day. Christmas was filled with lots of love and laughter. The kids got way to much :) Sophie was mapped again in December and we actually go back next week for another. But this last mapping has sure made a difference in her ability to hear soft sounds. I feel that she can pick up on more of the higher pitched sounds. She is able to pick up on the S sound more often. She is speaking a lot more words. Her vocabulary has grown so much since her last mapping. Sophie speech is going great. She still amazes us at each session. Price has also been doing marvelously. He sees his speech and TOHI each once a week. He last report showed he was right on course on meeting his goals. So that makes me happy too. Another great thing that happened over the last couple of months is I was awarded Infant Financial Aid for Price and Sophie thru AGBell. So that was also another great achievement for us. For more information on the Financial Aid that is offered thru AG Bell visit their website at www.agbell.org I will continue to work very hard at getting my children all they deserve. her brothers playing in the back of the house! the water running in the kitchen sink! my blinker on my van! the horn on my car! microwave and the "bing" when food is ready! Gosh I am sure there are more! It has been so exciting to see her face when she notices a new sound. It is like watching her take her first steps again and again! Her AVT says she is doing wonderful!!!!! They are having to come up with new goals because she is flying thru the ones they have already set for her. She is making me so proud!!! Way to go SOPHIE!!! Price completed his first day of school with flying colors. His teacher, Mrs Kathy, said that he was so sweet and is going to be a great asset to the class. She said that he was singing "his heart out" when they sang "Itsy Bitsy Spider." She also said that he played wonderfully with all the other children. GOSH!!! My little man is in "big boy school." Tomorrow he will start riding the bus. I WILL get pictures of that!!!! I am sure I might cry seeing him taken away by the "cheese wagon." HAHA!!! Tomorrow will be Sophie's first day going to school by herself :( Sophie and Price have been together since Sophie was born. Price would hold Sophie's hand and bring her to her class every day. Now she will have to go alone:( I am sure I am more upset than she will be!!!! Back in August Price was evaluated through the Livingston Parish School Board, for developmental delays due to his hearing loss. He was found to have some mild delays in speech do to his hearing loss which made him eligible for services through the school system. He qualified for speech therapy, a teacher of the hearing impaired, an audiologist, and assistive technology. Due to an opening he is also eligible for a spot in a reversed mainstream Pre-K class at a local elementary school. This is a class that is compiled of "normal" developing peers along with children with special needs. This class is for 3 and 4 year olds; therefore, Price will attend this year and next. I think he is going to do great. We had our first IEP meeting on Tuesday and I was VERY happy with all that was written out for Price. I could not believe how detailed and organized it was. His teacher and his therapists seem to be on target with Price's needs. I was very impressed. So we decided that he will start on Monday. YAY!!! I am kinda nervous but I know this is going to be a great step in his educational life. I am very thankful. Sophie, Molly (my sister), Amy (my sister), and myself drove down to New Orleans last Friday for Sophie's activation. For some reason I was VERY nervous. I was so curious as to what was going to happen I suppose. The appointment was actually a lot more calm than I was expecting. Claire, Sophie's audiologist, is the sweetest ever. She was so thorough with everything she was doing and telling us. She first explained how the processor worked and how to put it all together and all the different ways Sophie can wear it. Then she pulled out this HUGE box of stuff that went along with it. WOW, that was pretty overwhelming. I am still scared to open it. The "box" is not to be touched by anyone but me! When Claire initially put the processor on Sophie and then turned it on, Sophie turned to me and smiled. I knew she was hearing something. That was sooo exciting. Then my sister's and I were like, "Sophie can you hear me," "Sophie, say MaMa," "Sophie, say "Molly." HAHAHAHA!!! Sophie was smiling and playing with all the toys the entire time. After a while, she did get tired of being in the room so we decided to give her a break and walk around a bit. Her processor is HOT PINK!!!! The cutest thing ever. It matches her Hearing Aid she wears in the other ear. After leaving the mapping session we went shopping at the local mall and I was very nervous leaving the "box" in the car while we shopped. And I was also nervous about her having something so expensive on her ear and walking around the mall. I am so scared we will loose it!!!! But I have found out it doesn't fall off very easily. Although, after getting back to my sister's house that day, Sophie was playing and ended up standing really closely to one of her walls in her kitchen. Come to find out some of the walls in my sister's house have metal on top of the wood but under the paint (unable to see by looking at them). Well when Sophie walked away from the wall, the processor and the coil were stuck to the wall and Sophie was saying "Uh, Ohhhh" and pointing at the processor. It was really funny!!!! It gave us a good laugh. I am very pleased with how Sophie is doing since being activated. There are 4 programs we are to go thru by the time we go back to her second mapping. We are already to the 4th program. Sophie has never minded me increasing the volume or jumping to the next program. Although I do find she is A LOT more tired at the end of the day. So all in all, I am VERY happy I made this decision for her. I can't wait for her AV therapist to see her on Friday. And to hear what she has to say about Sophie's progress in one week. WAY TO GO SOPHIE JANE!!!! MOMMY IS SOOOO PROUD OF YOU!!!! Our pediatrician wanted to have all our children tested to see if they may have characteristics of Alport's Syndrome. Alport's Syndrome is a condition that affects connective tissue in the ears (progressive hearing loss), eyes (cataract's), and kidneys (filtering toxins out of blood). The initial testing beings on urine specimens. Andrew and Sophie's tests came back negative for blood which was great! Price has had 2 urinalysis's' both showing small amounts of blood. Hematura, blood in urine, is a characteristic of Alport's sydrome. So needless to say, yesterday I was a complete mess. With the syndrome comes complete kidney failure in males between the ages of 20 and 30 years of age. But after talking with a nephrologist, he doesn't think this is the case with Price. There should be a family history that shows kidney disease. After talking with family members there is no one who has ever had this problem on either Mike or I's side. So that is great news. Although we now have to monitor Price to make sure the hematuria doesn't get worse. Doc said that some children have this issue and grow out of it as they get older. So we will continue to have checkups to make sure all stays the same or goes away. THANK YOU JESUS!!! But don't think I wasn't on my hands and knees begging Him for my children's health. Oh this week I also decided that I was going to start selling Mary Kay. I have been wanting to for a long time but now that money is getting tight, I thought I would give it a try. My goal is to have a debt free Christmas. So we shall see how it goes. www.marykay.com/mikki.spence if you would like to check out our products or make a purchase. Hope everyone is having a great week! The cooler weather sure is nice. I could not imagine what it would be like not to hear. But two of my children have woken up each day of theirlife with little to no sound. My goal is to teach my children and others the knowledge and skills I have learned since finding out their hearing loss. First and for most, the terms hard of hearing and deaf should not be frightening. Although this is the initial reaction, just know that there is soooo much information and tools out there for parents and loved ones to get their hands on; not only through professionals but also through the internet. Secondly, there is a lot of hard work involved BUT in making sure your children are equiped for the rest of their life it is worth it. Their hearing loss is apart of our daily lives and will be forever. But at the end of each day it is nice to sit back and see how wonderful they are blossoming due to the lengths we have gone for them. Here we go tigers...here we go!!! My name is Mikki and I have three wonderful children, Andrew (9), Price (3), Sophie (18 months). I had perfect pregnancies with all of my children and all were born very healthy. In May 2008, we found out that our 2nd child, Price, and our third child, Sophie, were hearing impaired. Price was diagnosed as having moderate hearing loss, Sophie as severe/profound. Our oldest was tested and came back as perfectly normal hearing (although sometimes I think he hears too much). I hope to explain how all of this came about and how we are going to go forward. My children are awesome and I wouldn't change anything about them for the world. My husband and I both work. I thought it was going to be very challenging working full time and managing my children and their specialties. And guess what it is!!! HAHA! But for now this is what I have to do. But I have a wonderful family who helps me on a daily basis. My mom, sisters, and my neices and nephews are wonderful when it comes to support. If I cannot take off of work to take my children to their appointments they are there to help with no questions asked. I couldn't do it all without them. 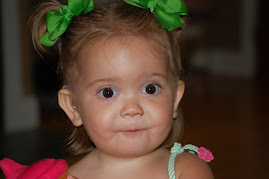 Laney Jane's journey with a cochlear implant.